The road between Indee Station and Karijini travels through a lot of mining areas, so we came across a lot of four trailer road trains. It also went through quite a few cattle properties, most without fences, so the cattle roam close to the road at times. Trouble is that road trains and cattle don't mix well and the cattle will always come off second best. With that being the case we saw many many dead cows on the side of the road. It was quite sad to see so many poor animals in various stages of decay. The only roadhouse along this trip was the Munjina (Auski) Roadhouse that got a lot of truckies and tourists calling in. It was really weird there, due to the red dirt surrounding it and blown up every where from the road trains the whole place including trees and white cockatoos were red, I mean totally red!! 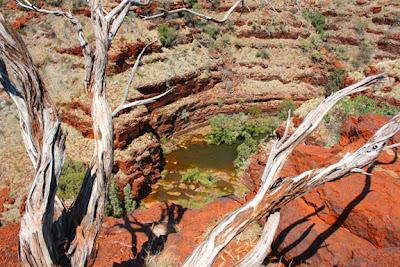 Once at Karijini we set up Myrtle in our little bush setting for the next few days. 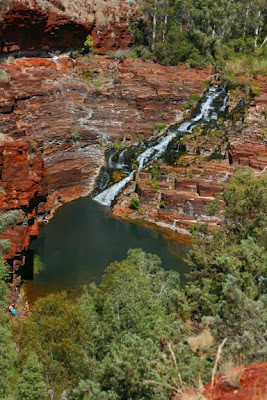 At 627,442 hectares (1,550,440 acres) Karijini is Western Australia's second largest National Park. Located in the Hamersley Range, Karijini has some amazing rugged landscape, stunning gorges and breathtaking waterfalls. Due to the secluded location of our camp we slept better than ever, surrounded by silence and stars. 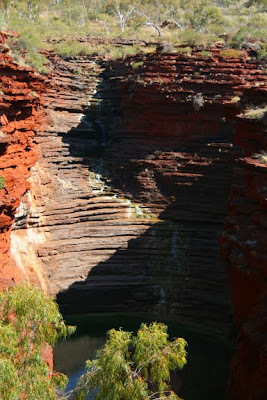 We decided to leave Myrtle at Karijini NP and drive into the mining town Tom Price for the night. 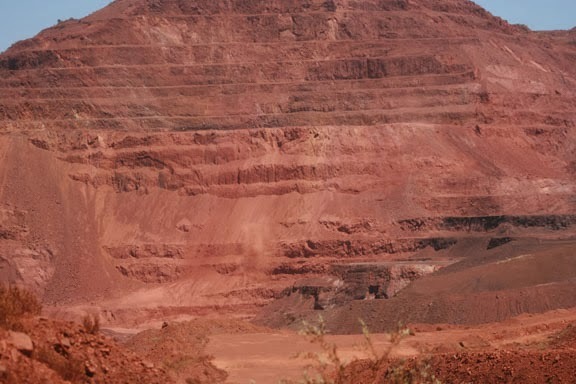 Tom Price is the highest town in WA at 747 mtrs above sea level. It was initially developed as a mining town and to live there you had to work for the mine. Today anyone can live there but I don't know why you would if you didn't work in the mining industry. 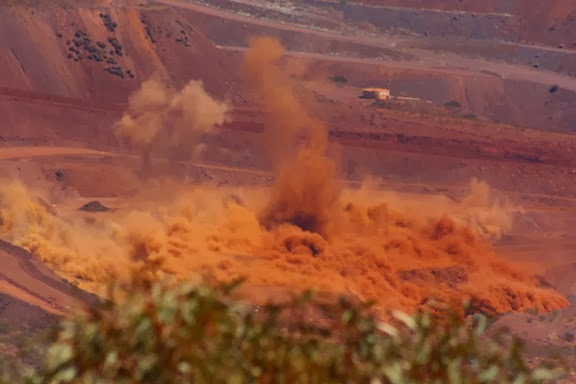 Rio Tinto basically runs the town with it's mining of Iron Ore. We have found that WA is quite expensive and Tom Price didn't disappoint. The motel we stayed was very basic, with a tiny room, the curtain half hanging of the track and the view out the window was boards where it had been boarded up. We didn't have much choice so here we stayed, but get this it cost us $244.00 for the night. Back in Melbourne you wouldn't pay any more than $100 for a room like this. But we will put that one down to experience. We decided to do a mine tour and it was one of the most interesting things I have done so far. 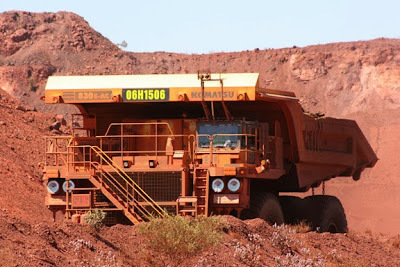 The open cut mine was immense and the huge trucks that transported the Iron Ore out of the hole were huge. There tyres alone would have been three times my height. The Ore is then transported to Karratha by trains some being 300 carriages long, loaded onto ships destined for China. It was nice to get back to Myrtle for a quite nights sleep in a comfy bed.